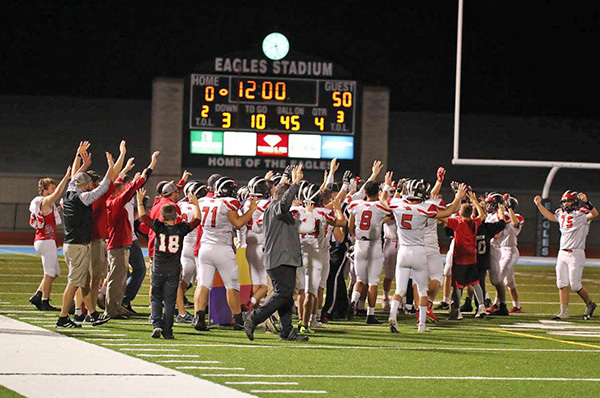 The Cedar Springs Red Hawks ran all over the field in their 50-0 win over Lowell last Friday. Courtesy photo. 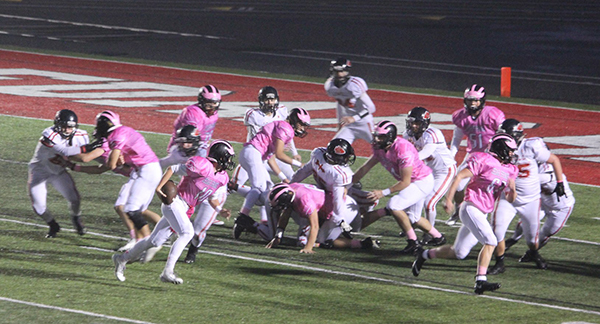 The Cedar Springs Red Hawks Varsity football team ran away with the win last Friday, October 6, on their way to a spot in the playoffs, when they hosted Lowell in their annual pink out game. The Red Hawks tore up the field in their 50-0 win over the Red Arrows, raking up over 500 yards, with two players getting over 100 yards, and three other players getting 55-plus. Much of it was in the first half. Ryan Ringler set a record on defense when he broke the previous school record of 301 career tackles. At the end of the game he had 304 career tackles, spanning from the 2015 to 2018 seasons. The first score of the game came with 10:47 left in the first quarter, when Sage Serbenta ran right for a two-yard touchdown. QB Kolby Swank then ran it in for the extra two points. Serbenta scored again with 5:41 left in the first quarter when he ran for a 62-yard touchdown. Swank’s pass to Serbenta was no good. Cedar Springs scored again with :56 seconds left in the first when Lucas Pienton ran left for a two-yard touchdown. Ethan West’s run in for the extra points was no good. The score at the end of the first quarter was Cedar Springs 20, Lowell 0. The Red Hawks scored again in the second quarter with 9:25 left on the clock when Ryan Ringler ran up the middle for an 85-yard touchdown. Pienton’s run in for the extra points was good. The Red Hawks scored twice more in the second quarter. With 4:27 left, Zack Schmid ran right for a 10-yard touchdown, and Swank’s run into the end zone for extra points was good. They scored again with 1:16 left when Ben Shaw ran up the middle for a 42-yard touchdown. The two-point conversion attempt was no good, and the half ended with the score Cedar Springs 42, Lowell 0. Cedar Springs scored once more in the fourth quarter, with 10:20 left on the clock, when Ethan West ran 49-yards for a touchdown. West then passed to Justus Larsen on the two-point conversion attempt and it was good. The final score was Cedar Springs 50, Lowell 0. The Red Hawks rushed for 512 yards, netting 505 after penalties. 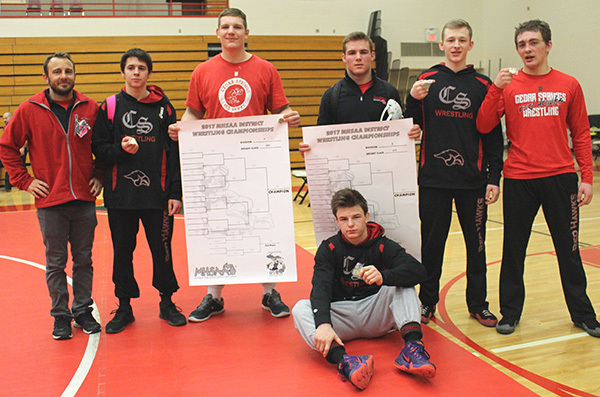 Serbenta rushed for 130; Ringler 128; Shaw 73; West 72; Pienton 55; Landon Totten 24; Swank 19; and Schmid 13. Pienton also had an interception. On defense, Gage Gardner had the most tackles with 8; followed by Zack Schmid and Xavier Anderson with 6 each; Ringler with 5; and several others with 3 or less. “I’m happy with our performance and I thought our guys played well and we were able to play a lot of our bench guys who haven’t gotten a lot of playing time this season,” said Coach Kapolka. Cedar Springs is now 4-0 in conference, and 6-1 overall. They are in first place in the OK-White, with Northview a close second (4-1, 5-2). There are two weeks left in the regular season. The Red Hawks travel to Grand Rapids Ottawa Hills (0-5, 1-6) this Friday, October 12, and then host Forest Hills Northern (2-2, 4-3) on October 19. Come out and cheer on your Red Hawks! On Tuesday, January 5, the varsity basketball game had fans on the edge of their seats as Cedar Springs went head to head with Lowell. “Lowell is one of the better teams in the area this season. We battled with them throughout the game,” said Cedar Springs varsity basketball coach Jeff Patin. The Red Hawks lost against Lowell with an ending score of 73-58. The game was close and the basketball team definitely gave the Arrows a run for their money. “We played Lowell last year in the regular season and the districts, unfortunately, [we lost] both times. Their program has improved much in the last several years,” said Patin. Although Cedar Springs suffered a loss at Lowell, there were some highlights throughout the game. Jameson Pavelka led the team with 17 points, and Taylor VanDyke added 14 points and 12 rebounds. The Cedar Springs varsity basketball team has not won against Lowell the last few times they played against them, but their losses against the team will not hinder their hopes for the next time they take them on. 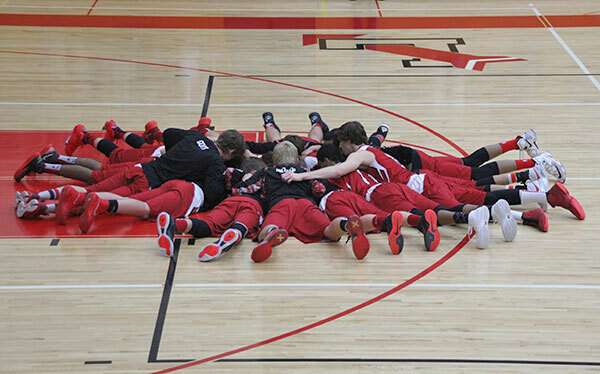 The Cedar Springs varsity basketball team also battled it out with Wyoming on Friday, January 8. “It was our first league game and we wanted to come out with a good start. We didn’t play particularly well in the first half. We were trailing by 9. In the second half, we fought back and took the lead midway through the fourth quarter. From that point, the game was back and forth,” said Patin. Unfortunately, the Red Hawks lost that night against Wyoming with a final score of 69-66. “Losing on Friday is a minor setback for us, but we’ll keep focusing on the areas we need to improve,” said Patin. It wasn’t the strongest week for the varsity basketball team, but they’re taking the losses against Lowell and Wyoming and spinning something positive out of it. “Our defense has continued to improve. We will [continue] to work in all areas as we approach the midpoint of the season,” said Patin. The Kent County Sheriff Department reported late last week that there have been many home break-ins throughout Kent County recently. Many have occurred in rural areas where homes are not close together. Daytime home break-ins have occurred everywhere: Algoma, Cannonsburg, Lowell and Byron Townships. Break-ins occur at all times of day, in any season and in all neighborhoods. The KCSD asks resident to please be aware of, and report, any suspicious persons or vehicles. When possible, write down license plate numbers. They advise you to protect your home by being discrete. Don’t advertise your items of value. Keep valuables out of plain sight of doors and windows. If you are throwing away boxes or bags that depict valuable items such as TVs, computers or jewelry, make sure they fit in you trash or recycling can. Cut or shred as much information as possible. Keep all exterior doors and windows locked. Make sure your home is well lit. Keep criminals guessing as to whether or not you are home. Utilize interior lights and, if possible, different lights through-out the home when you are not home. Keep an eye on your neighbor’s house as well and report anything out of the ordinary. To report any crimes or suspicious activity, call the Kent County Sheriff’s Department at 632-6100 or 911.